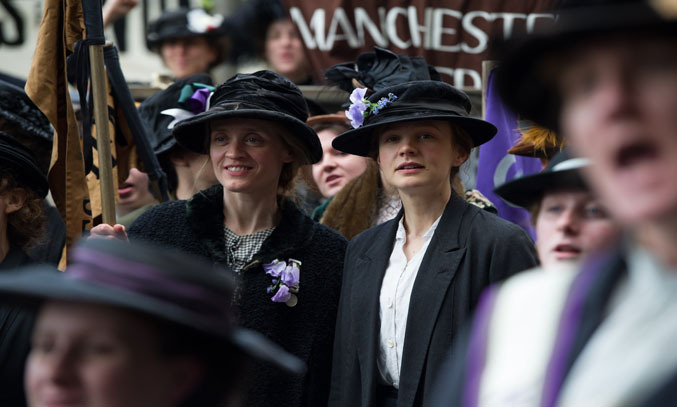 Opening the 59th BFI London Film Festival is the European Premiere of SUFFRAGETTE starring Carey Mulligan, Helena Bonham Carter, Anne-Marie Duff, Brendan Gleeson, Ben Whishaw and Meryl Streep. Set during the early feminist movement, SUFFRAGETTE tells the story of the ordinary British women in 1912 and their fight for the right to vote. The film stars BAFTA award-winning actress Carey Mulligan in the lead role as Maud, a young woman from the East End of London who together with her friend Violet (Anne-Marie Duff), local chemist Edith (Helena Bonham Carter) and upper class campaigner Alice (Romola Garai), risk everything including their jobs, their homes, their children and their lives, in the fight for dignity, equality and change. Director Sarah Gavron has long cherished an ambition to make a film about the Suffragette movement and together with her team, went to extensive lengths to produce the intense drama. “I was amazed that this extraordinary and powerful story had never been told” comments Gavron. The film gets right to the heart of the feminist movement as the Suffragerres cut through telegraph wires, attack property and even go on hunger strike to draw attention to their fight for equality against an increasingly brutal state. “Nobody I know is aware of hunger striking or the more extreme attacks some of the women made on public art galleries and buildings” admits Carey Mulligan. With its intense script, stunning costume design and all-star cast including Carey Mulligan, Helena Bonham Carter, Anne-Marie Duff, Brendan Gleeson, Ben Whishaw and Meryl Streep as Emmeline Pankhurst, it is no surprise that SUFFRAGETTE is tipped to be an awards contender later this year. Film fans can enjoy a live cinecast from the Opening Night red carpet of the 59th BFI London Film Festival via satellite to cinemas across the UK, followed by an exclusive preview screening of SUFFRAGETTE. All the red carpet action will also be live-screened on the BFI’s YouTube channel, thanks to Pathe and Google.